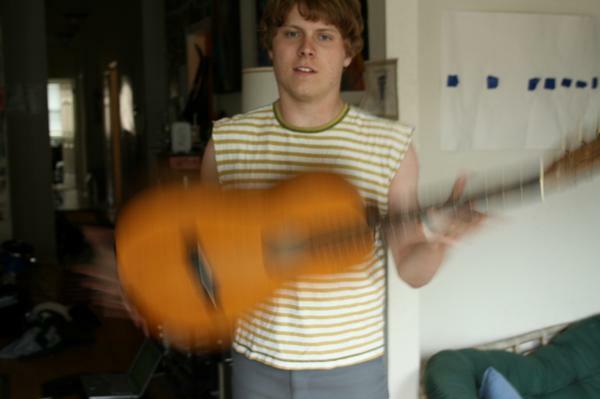 Ty Segall – A RROSE IN A PROSE REVIVAL! I just saw this kid twice in one week–one of my bands played with him under a bridge in Frisco, where he performed as a two-piece, and then I caught him playing at a house party in Echo Park Friday night just by his lonesome. He’s been in a bunch of awesome bands, like Epsilons and Traditional Fools, but solo he was somethin’ else. Especially as a one-man band, when he plays drums with his feet, keeping time to his own guitar riffs while playing bluesy four-four garage rockers, he made me shake my wiggle thang many times in a row. It sounds like a simple formula, but the only thing I can think of in recent memory that sounds like this is the Reverend Beatman. Not sure if Ty knows about him, but Ty’s bringing that same energy, but with less European obsession and more youthful transcendance. Or something. Previous Post the Soda Pop Kids – Twin Peaks is an awesome way to tune up! Next Post Monica Goodling’s guide to interviewing job applicants.